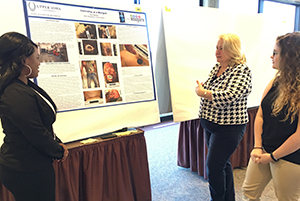 (From left) Zory Hamblin, an Upper Iowa University biology major from Worthington, Minnesota, discusses her prizewinning poster with UIU Provost P. Joan Poor and Madelaine Quistgaard, a UIU senior forensic science major from Bloomington, Illinois, at the recent LSAMP Conference in Ames. Poor provided the welcoming message and Quistgaard was recognized as UIU’s LSAMP Outstanding Student at the annual event. 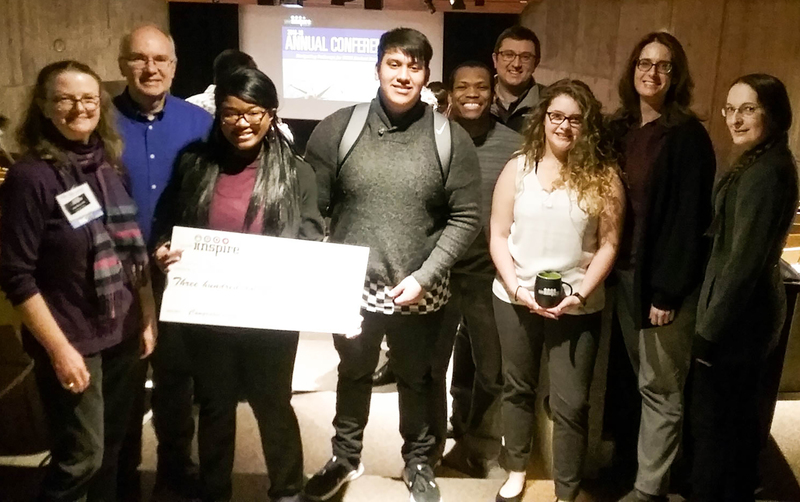 A pair of Upper Iowa University students were recently recognized at the annual Iowa Illinois Nebraska STEM Partnership for Innovation and Research and Education (IINSPIRE) Louis Stokes Alliance for Minority Participation (LSAMP) Conference in Ames, Iowa. Zory Hamblin, a biology major from Worthington, Minnesota, placed first for her poster that described her summer internship at Sanford Health Pathology Clinic in Sioux Falls, South Dakota. Madelaine Quistgaard, a senior forensic science major from Bloomington, Illinois, was also recognized at the conference after being named UIU’s LSAMP Outstanding Student. Among the Upper Iowa University faculty and staff attending the 2019 IINSPIRE LSTAMP Conference iN Ames, Iowa, were (l-r) Professor of Geosciences Dr. Katherine McCarville, Professor of Physics and Mathematics Dr. Nigel George, Zory Hamblin, Mickey Vazquez, Ryan Wooten, Assistant Professor of Biology Dr. Paul Skrade, Madelaine Quistgaard, Assistant Professor of Biology Dr. Rebecca Schmidt, Assistant Professor of Mathematics Dr. Dana Bates. The participating panel members for the event included Karri Folks, an ISU graduate student in the Natural Resource Ecology and Management (NREM) and Anthropology departments; William Peek, USDA Natural Resources Conservation Service wetland specialist; Jeramie Strickland, U.S. Fish and Wildlife Service, Upper Mississippi River National Wildlife & Fish Refuge; and Charla Wilson, ISU senior animal science major. Additional UIU attendees included Professor of Physics and Mathematics Dr. Nigel George, Assistant Professor of Biology Dr. Rebecca Schmidt, Assistant Professor of Mathematics Dr. Dana Bates, freshman biology major Miguel Vazquez of Fort Dodge, Iowa, and sophomore biology major Ryan Wooten of Willowbrook, Illinois. IINSPIRE is a Louis Stokes Alliances for Minority Participation (LSAMP) program funded by the National Science Foundation (NSF). The alliance brings together 16 two-year and four-year colleges and universities that are working to broaden the participation of underrepresented minorities in science, technology, engineering and mathematics (STEM) education in the Midwest. The participating institutions collaborate to support and increase the success of students and provide students in the alliance with academic, research, training and mentoring opportunities, including scholarships and research stipends.